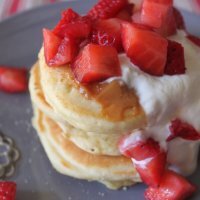 Strawberry Buttermilk Pancakes: These buttermilk pancakes are thick, fluffy, moist, cake-like pancakes. 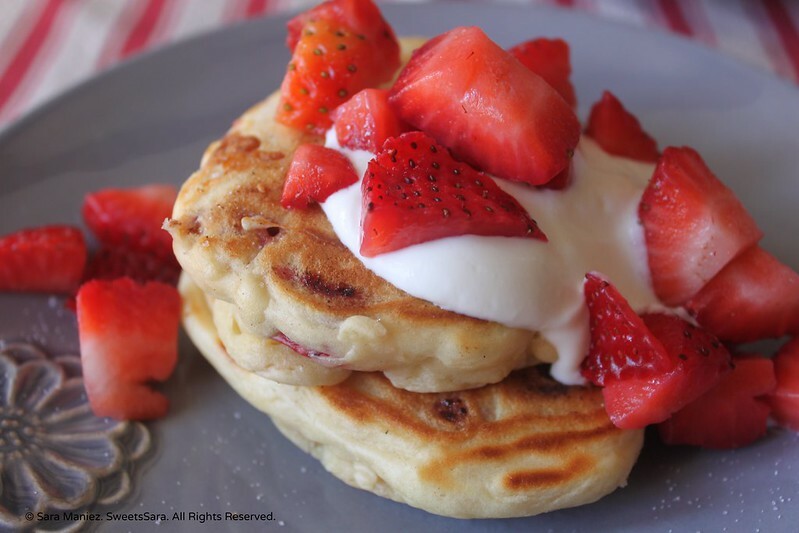 They work well with fresh strawberries in the batter, on top only or both. Dulce de Leche is another flavor component in this assemblage that provides a smooth, caramel punch of sweet and it compliments the Greek yogurt well. 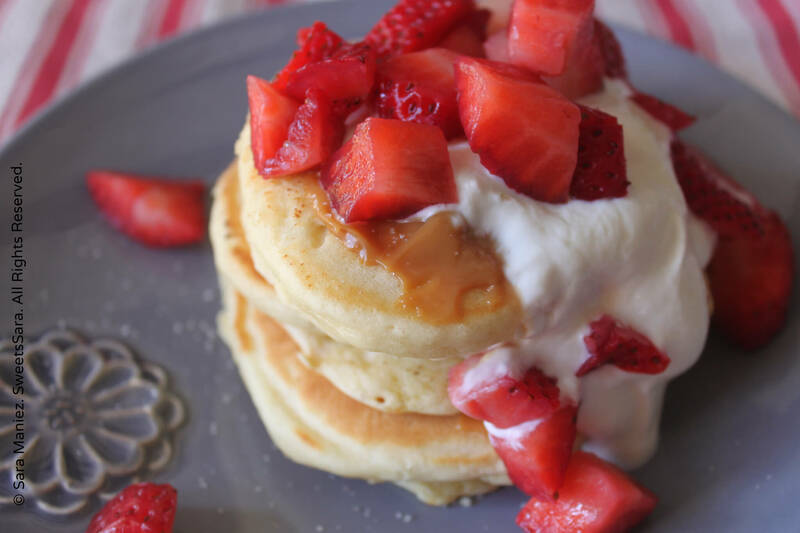 Try Greek yogurt on buttermilk pancakes with Dulce de Leche and strawberries. Greek yogurt is a tasty, versatile ingredient that can be used almost like sour cream in savory dishes, yet has a tartness that lends itself well for sweet flavor combinations. I used it recently as a snack with nuts, oatmeal, dried fruit and maple syrup, then the other night, I dolloped onto a lentil soup, so as I made pancakes this morning, I thought, why wouldn’t it work as an alternative topping to the standard whipped cream? 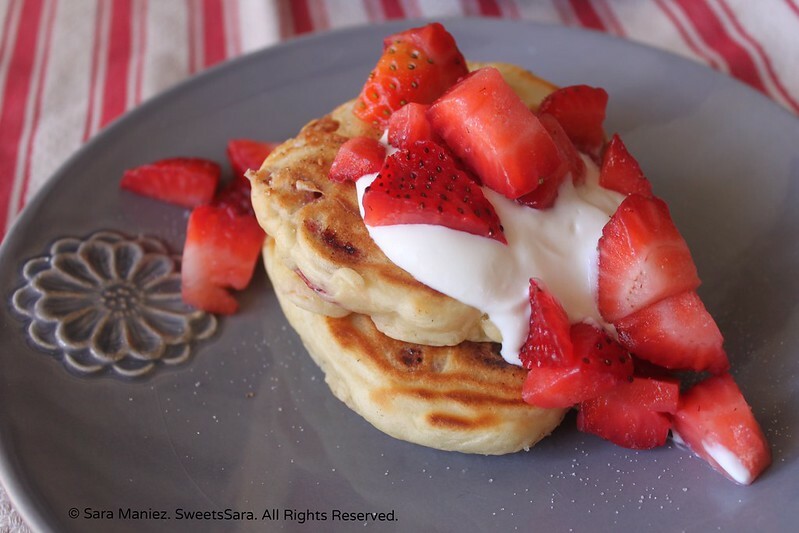 Here’s to having traditional buttermilk pancakes in a fresh, new way! 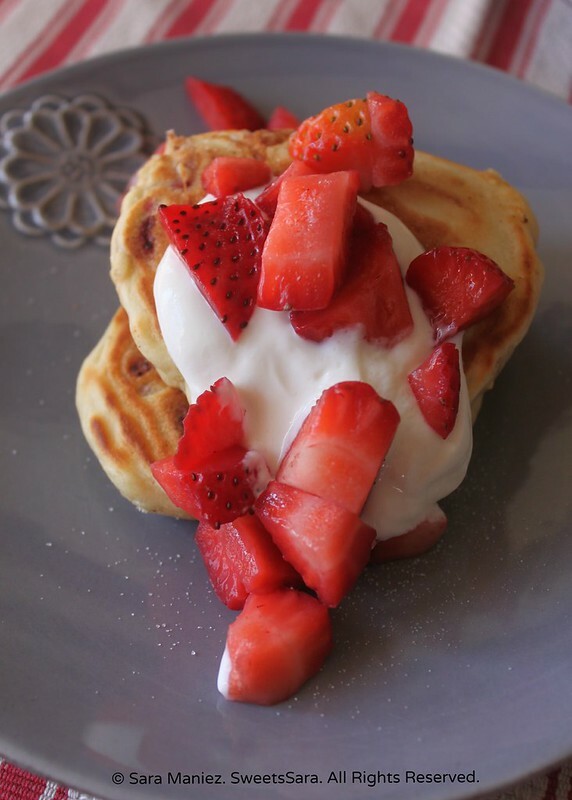 Strawberries can be on top or mixed into the buttermilk pancake batter, here, they are mixed in and on top. Check out my Amazon aStore to see and purchase my favorite ingredients and tools! 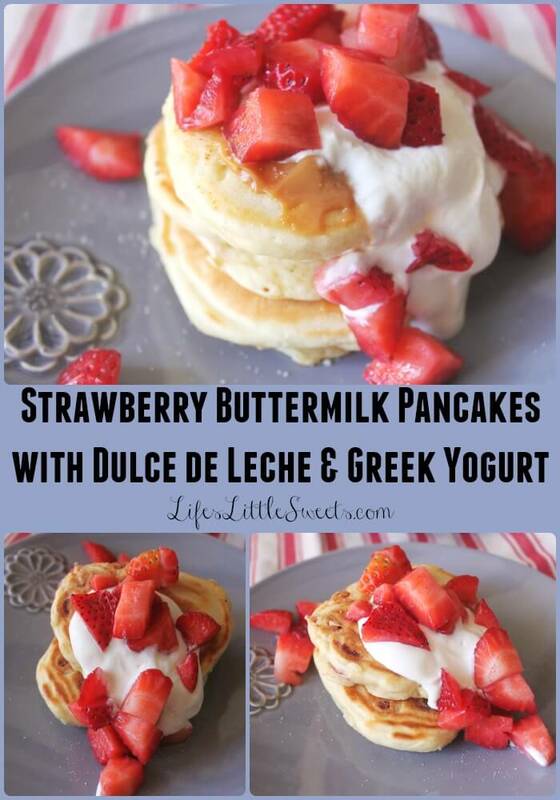 *Optional syrup or spread I used Dulce de Leche, , *See Recipe Credits below on how to make it. In a large bowl, combine flour, sugar, baking powder, baking soda, and salt. In another bowl, stir together egg, buttermilk, and oil. Add egg mixture to dry mixed ingredients. Stir until just combined. It's okay if the batter is slightly lumpy. Add desired fruit in the batter or on top later. Using a 1/4 cup measure, scoop the batter onto a heated, lightly greased, non-stick, large skillet, cook over medium heat for 1-2 minutes, on each side or until desired browning is achieved. Serve warm with a dollop of Greek yogurt and desired syrup. Optionally, sprinkle with some granulated sugar. *Prep and cook time does not include the time to prepare the dulce de leche. -Try using whole wheat flour in place of the regular flour and brown sugar instead of the granulated sugar. -Try whipped cream instead of Greek yogurt, or perhaps make this as a dessert instead of breakfast and serve it with some ice cream. -Real maple syrup or Nutella make yummy syrup and spread options. 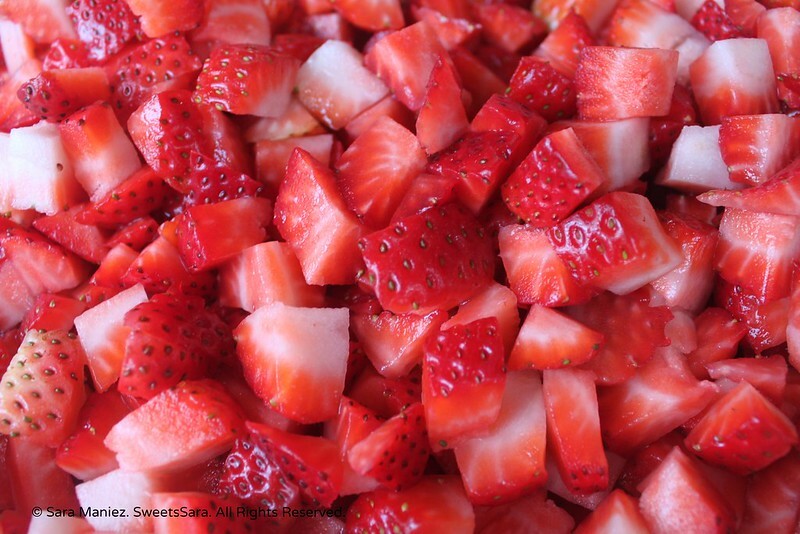 -Instead of strawberries, blueberries or another seasonal fruit. This combination utilized the recipe “Buttermilk Pancakes,” p.137 of the Better Homes and Gardens New Cook Book. You can buy Dulce de Leche, but sometimes it can be difficult to find in the store. While this way is easy, it does take 3 + hours to make it, plus time for it to cool, so it is best to prepare it ahead of time. You can make a few cans of it at a time, and it will keep for months in the refrigerator and you can use it for so many things, for example, with coffee, a spread, in a cake or on top of ice cream, just to name a few. 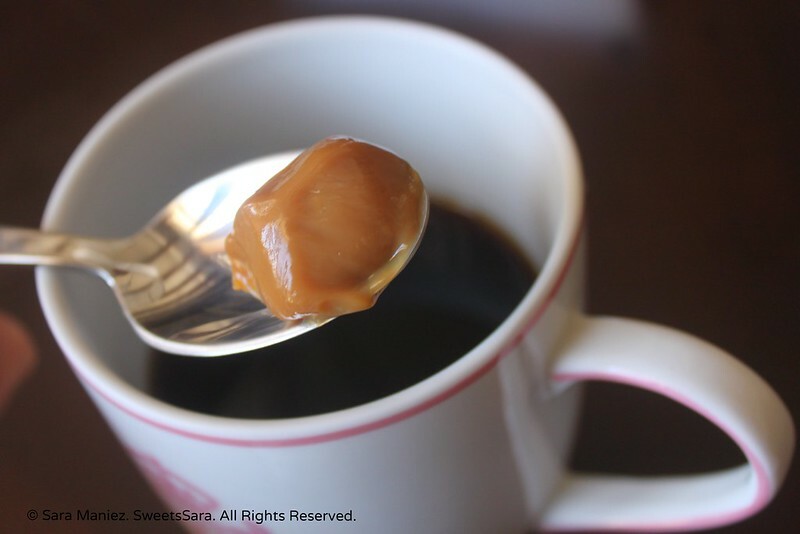 Don’t forget to try some Dulce de Leche in your coffee, it’s delicious! If you share on social media, be sure to #lifeslittlesweets and link back to the post, thank you in advance! Oh gosh these look great!